Our Trout and Salmon Meal Formula combines two of the healthiest fish protein sources in the world. Both fish are high in heart healthy Omega-3 fatty acids. They are also rich in minerals, namely potassium, phosphorous, and selenium. They combine to promote healthy blood pressure, strong bones and teeth, and robust immune system. Our recipes are always grain free for a healthy, hypoallergenic diet. We bring together two great tasting fish that you dogs will love. Zignature® Trout and Salmon Meal Formula – Learned from Nature, Crafted to Perfection. 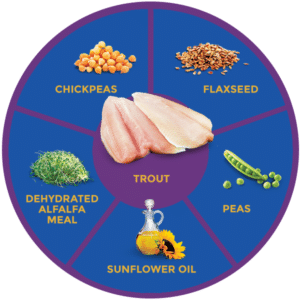 Trout, Fish Broth, Salmon, Peas, Chickpeas, Agar-Agar, Calcium Carbonate, Salmon Meal, Sun-Cured Alfalfa Meal, Carrots, Potassium Chloride, Salt, Choline Chloride, Cranberries, Blueberries, Minerals (Zinc Proteinate, Iron Proteinate, Copper Proteinate, Manganese Proteinate, Sodium Selenite, Calcium Iodate), Vitamins (Vitamin E Supplement, Thiamin Mononitrate, Niacin Supplement, Calcium Pantothenate, Biotin, Vitamin A Supplement, Riboflavin Supplement, Vitamin B12 Supplement, Pyridoxine Hydrochloride, Vitamin D3 Supplement, Folic Acid) L-Carnitine.